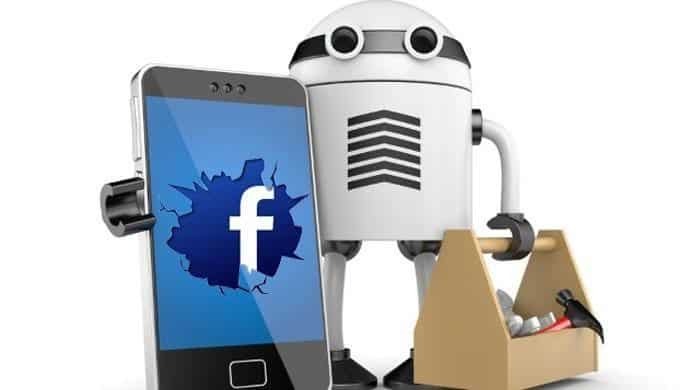 Social media bots and automation tools are softwares that have been created and designed to help in automation of your normal daily social media activities. The bots and tools have been created in a special way to save time and simplify tasks that would have taken more time if you did them yourself. The tools have in general, been created to make social media an even better place and they indeed had quite a huge impact. Whether for marketing or just personal use, the bots and automation tools are able to grow your social media accounts and most importantly make it easy for you even when you are busy with your normal daily activities. 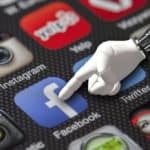 As time goes by, several social media bots have been created, some of them general in a way that they automate most of the general social media activities. Some other bots have been created with specificity to a given social media platform. In this guide, we are going to look at the top automation bots and tools that you can have for your social media. We will start with the general bots and automation tools and then finish up by discussing specific bots for specific social media channels. We will start by outlining the general bots and automation tools that you can use for all social media automation. In other words, these are bots and tools automation softwares that are compatible and have been made to automate specific functions on (almost) all social media. Jarvee is one of the most popular bots to have ever been created. It is number one on this list for a reason. Jarvee is popular for all reasons, the main reason being, it is one of the most flexible and compatible bots you will ever find. Being a Windows-based automation tool, you can have it on your PC. it works well with windows 7 and higher(Windows 8 and 10). The bot automates all your social media activities from Pinterest, Twitter, Facebook, YouTube, Tumblr to LinkedIn. Jarvee will offer you a 5-day trial to give it a try before you finally decide to purchase. After the 5 days, you will be charged $19.99 per month which is quite affordable. Your social media growth for all your accounts is safe and fast with Jarvee. Let’s find out how Jarvee works on each social media platforms. i) Post scheduling – Jarvee lets you make your posts when most of your fans are engaged. Scheduling of posts can be on your normal posts on your timeline or even Instagram stories. Strategic posts schedules could get you featured in the top 9 featured posts and thus improving your organic reach. 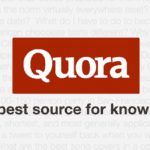 ii) Auto reposts– Jarvee lets you find the greatest of posts in your niche and reposts them on your account. The circle of influence around you will enlarge with this feature because you will have other users in your niche on your timeline. 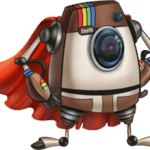 iii) Auto follow – Jarvee helps you to automatically find Instagram users that fall within your niche and follow them. Once you follow them, it will draw their attention and they will fancy following back. Once they do follow back, it means your audience will be growing. v) Unfollow – If you have a large list of followers that find unmanageable, you can unfollow those users you think are not worth your follow or do not fall in your niche. Sometimes, users do not follow you back if you followed them. You can decide to unfollow them. Jarvee can do this for you. vi) Auto-Like – Jarvee helps you to automatically find high quality content and posts all over Instagram and like them automatically. This kind of activity stimulates a response from the users who you liked their content and they could also visit your profile to find out more about you. vii) Auto comment – Jarvee automatically comments on posts which enhances engagement with other Instagram users. viii) Delete posts – Jarvee helps you automatically find and delete posts that you think did not get enough engagement or were not good enough. Deleting the worst performing posts can do a lot of good for your Instagram account. ix) Contact prospects– In just but one place in Jjarvee, you are able to keep in touch with many people. Jarvee creates a message and sends to your new followers. x) Manage your DMS – In just one place, you can be able to manage all conversations through your PC. xi) Hashtag research – Jarvee is made with a Dynamic Hashtag feature that circles your hashtags to stretch out to many people. The hashtag research tool helps you search for well performing and related hashtags in your niche to use in your post. xii) Block followers – Jarvee lets you do away with people you do not want to engage with by blocking them. xiii) Find then extract Targeted users – Jarvee also helps you search for commenters, followings, followers, and likers of your target users based on hashtags and keywords. xiv) Manage Comments – In one place you can manage all your comments in all your Instagram account. With a click of a button, Jarvee enables you to enable or disable your comment section on your posts. xv) Delete comments -For comments that do not match your criteria, simply delete them automatically using Jarvee. xvi) Like comments– Sometimes people lack time to give replies to every comment they get on their posts. Jarvee lets you like all the comments with a single press of button to show much appreciation to the users who commented on your post. xvii) Save Posts – Javee lets you set filters in terms of number and likes for your posts. If the post surpasses the likes and comments, you can automatically save it for specific users. xviii) Automatic Phone Verification – Jarvee automatically does your phone verification when necessary. So do not worry about having to do phone verification every time which is sometimes annoying. 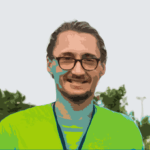 xix) Spin Syntax – You can now automatically create unique messages in the text fields with this feature. This means, if you use DM to get to your prospects, they will receive a unique message that would not look like it was automated. i) Scheduling Pins – If you want to plan your pins and keep them waitlisted so that you can drip-feed them slowly throughout the day, week and even month onto your board the Jarvee has got you covered. ii) Auto Repin – The Auto Repin feature automatically repins viral pins to your board. Jarvee’s search options based on keywords and, therefore, it becomes easy to repin your viral posts. iii) Video Pins – To mix things up on your Pinterest board, Pinterest now has a video option which means you can add content to your Pinterest boards. Jarvee also works magic in adding videos to your Pinterest board. We all know how videos, in turn, work magic in attracting new followers sometimes even more than images do. iv) Monitoring Progress – Jarvee provides you with a concise and transparent compilation of data and statistics based on your Pinterest performance that you can analyze. This kind of analysis gives you an insight into what you can improve and thus grow your account. v) Spin Syntax – this feature which is available throughout the platform allows you to get creative with your Pinterest messages. vi) Watermarking Pins – this feature allows you to watermark your original pins to give them the authenticity they deserve. That means that if someone else repins them your name will show. vii) URL shortening – To avoid clogging your messages, Jarvee shortens the URL automatically which leaves them very straightforward and clean. There is so much more Jarvee can do for your facebook. Let us take a look below. i) Post Scheduling– Jarvee lets you make your posts when most of your fans are engaged. Scheduling of posts can be anywhere including, personal Facebook account, pages, and even groups. iii) Campaign Statistics and Insights – After a deep analysis, Jarvee will always provide you with insights, which you need and shows you where to improve. iv) Find Pages and Groups From Your Niche – You will not find a better group finder around. Jarvee, with the intelligent algorithm automatically searches for pages and groups that could be useful in your niche. v) Join/Unjoin Groups – Through Jarvee, you can automatically join the groups you find helpful in your niche and once you realize they are not useful you can unjoin/leave them. vi) Ignore Groups – The tool also lets you avoid certain groups you do not want to be associated with. viii) Scheduling Posts From the RSS Feeds – The bot lets you import high quality fro RSS feeds and late on post in your group, Facebook pages, and personal account. ix) Auto-Invites to your Group – The Jarvee bot invites your friends to the group and you will get them to be engaged with the activities of your brand. x) Auto – Invites to your Events/Page – This feature will let you grow your Facebook page quite fast because it automatically invites friends to join. xi) Auto Comment and Like – Jarvee enables you to auto like and comment on newly uploaded groups, walls, pages or searches which raises your engagement game and, in turn, there is a rise in traffic and following. xii) Auto Accepting Friend Requests – This feature saves your time especially if you are working with a number of accounts. Your friend requests will be accepted with Jarvee. xiii) Auto – Replying Messages– This feature is for those who are not online at all times but they want to reply to the messages. Jarvee can respond to the messages for you when you are not online and once you are back, you can keep on with the conversation. xiv) Sending Friend Requests -With Jarvee’s advanced algorithm, you can stretch out to target people who are more likely than not have an interest in your business. xv) Auto-Changing the Cover Photo – Cover photos have big impacts n any Facebook account or page. Therefore, with Jarvee, you can create a number of photos for your account or page and let it rotate them for your own benefits. xvi) Turn Off Notifications – Sometimes you get annoyed by the noise of notifications especially if you are in a number of groups. Jarvee helps you to automatically turn them off. i) Post Scheduling – You can now plan all your tweets and thereafter publish them when your audience is receptive. Jarvee helps you save time on daily repetitive work you through automatically setting up your tweets in advance. ii) Twitter Mention – Jarvee can also help you in finding your target audience and ultimately mention them in your messages. This feature is quite personal and very powerful. iii) Auto Follow/Unfollow – The tool also helps you find Twitter users who might be interested i your content. Eventually, you can then follow them and draw their attention. iv) Auto Followback – With Jarvee you can automatically follow back users who followed you to help you keep in touch. This feature is very important for brands that do marketing on Twitter as it becomes easy to connect with your potential customers. v) Auto Retweet – With this feature on Jarvee, you can now keep your account active as you find and retweet inspiring tweets from your niche. This feature builds quite a strong business bond with your prospects. vi) Automatic Hashtags – You can now convert specific keywords into hashtags automatically to increase the visibility of your tweets using Jarvee. vii) Automatic Favourites – with Jarvee you can now find best tweets in your niche and automatically favorite them. 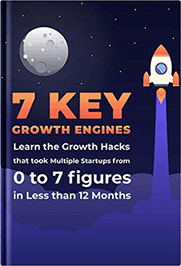 This is important for your account growth as it kickstarts interactions with many users in your niche. ix) Spin Syntax – You can now automatically create unique messages in the test fields with this feature. This means, if you use DM to get to your prospects, they will receive a unique message that would not look like it was automated. x) Send DM’s to Targeted Users – This Jarvee feature allows you to search for certain users and contact them automatically through their direct message. This increases the conversion rate in your marketing campaigns. xi) NightMode – With Jarvee, you can automatically turn on the night mode while you go to bed or when your audience is not online. This gives you a break from the normal day Twitter setting. i) Post Scheduling – Jarvee ensures that you publish your LinkedIn posts at the proper times for maximum stretch out to your audience through post scheduling. ii) Campaign Insights – Jarvee can also show insights and data that you may require during some decision making moments and this has an improvement of the future gains. iii) Finding Groups In Your Niche – The advanced Jarvee algorithms will help you search for targeted groups within your niche and thereby stretching out to your potential customers. iv) Join/Unjoin Groups – With Jarvee you can join and join groups that fall within your niche automatically. This is with the help of the Group Finder tool that comes with Jarvee. Once you feel out of place in some groups you can unjoin them automatically as well. v) Ignore Groups – Add certain Linkedin groups on the ‘ignore list’ feature that comes with Jarvee to avoid posting into them accidentally. vi) Invite friends to Groups – This feature helps you to automatically stay connected as it invites LinkedIn contacts to join your group. vii) Auto viewing of profiles – Jarvee lets you visit other LinkedIn’s users’ accounts. Once they are informed, it raises their curiosity and makes them check your profile in turn. The eventual effect will be felt as your Linkedin network grows. ix)Auto Comment and Like – Jarvee lets you to automatically comment and like on your prospects’ post, which gets your LinkedIn account more attention. x) Send Messages to Connections – The tool helps you engage with your LinkedIn network by sending them reasonable messages automatically. xii) Auto – Accept Connection Request – On the other hand, Jarvee helps you to accept requests sent by other users automatically. xiii) Spin Syntax – You can now automatically create unique messages in the test fields with this feature. This means, if you use DM to get to your prospects, they will receive a unique message that would not look like it was automated. i) Auto Follow/Unfollow – The ‘follow’ part of this Jarve feature allows you to follow other people in your target audience. This gets you more exposure and ultimately you will get some subscribers as they will notice your content on YouTube. ii) Auto-Like – The ‘like’ feature is popular on all social media networks and for YouTube, Jarvee works the same magic. The feature allows you to like other YouTube user’s videos. This makes you look like a very active user and you will also get people liking your videos. You can as well like your own videos if you have more than one account. iii) Commenting on Videos – Jarvee lets you have a thoughtful say on other YouTube user’s videos. This, in turn lets you draw the attention of the YouTube users in your target audience and in the long run the growth of your YouTube channel speeds up. iv) Like Comments – You can like the comments your followers leave on your YouTube channel To keep your followers engaged. You can as well like comments on other people’s videos so that your prospects can easily notice you. v) Full Browsing Experience – With Jarvee, your YouTube account will get a look that appears more natural with randomized activities in the name of simulating real human behavior. This is an advanced YouTube marketing used by pros occasionally. vi) Auto Watch Videos – The auto watch videos is a feature that watches other user’s videos automatically and at the same time you can use it to watch your own videos in the name of increasing the view count. vii) Spin Syntax Support – You can now automatically create unique messages in the text fields with this feature. This means, if you use DM to get to your prospects, they will receive a unique message that would not look like it was automated. viii) Proxy Support – Jarvee helps you run every Youtube channel on its own. Jarvee has a number of packages with all packages having a 5-days free trial meaning you will require your credit card during this period. Jarvee offers 3 packages : Starter package, professional package and premium package. The starter package priced at $19.95 per month has all the features but allows up to 10 social accounts. The professional packages which allow up to 70 social accounts, has all features is priced at $49.95 per month. The premium package allows up to 150 social accounts and is priced at $69.95 per month. FollowingLike is a perfect social media bot that runs multiple social media platforms including Facebook, Instagram, Tumblr, Reddit, Google+, Pinterest and LinkedIn, among others. The tool works by combining basic module functions to complex tasks to automatically execute any job on the social media networks. The bot simulates human operation to perfection that you will not get your account suspended or suspected for spamming. i) Follow Users – FollowingLike makes your work easy by automatically following users generally and following users who are discussing a certain topic using hashtags and keywords or language and location. ii) Unfollow Users – This feature allows you to automatically unfollow users who are not following you back. iii) Share posts -The bot helps you to automatically share photos and video even when you are not online to keep your profile active and engaged. iv) Like photos – The tool likes your custom list of photos on your feed or any photos posted by users you follow. v) Unlike Photos – The tool helps you to unlike your custom list of photos on your feed or any photos posted by users you follow and might not be interested in. vi) Comment on Photos – FollowingLike comments on photos of the users you follow automatically. The tool can as well comment on a custom list of photos. vii) Send DMs – You can communicate with your followers directly and keep them informed This feature sends messages to your followers t keep them engaged. viii) User/Post Search – The bot lets you search for users and posts automatically by use of hashtags and keywords. i) Follow Users – FollowingLike helps you follow users who followed you, liked your post or commented on your post automatically. iii) Add/remove Friends – From all imported lists of friend suggestion, you can add/remove friends who you think can be important/not. iv) Like and Unlike Pages – This feature allows you to like pages that are on the search list or imported list and you can also unlike the pages you think are not important in your niche automatically. v) Share Posts – You can automatically share the posts that appear on your feed and you think are worth sharing with this tool. vi) Comment on Posts – The feature allows you to automatically comment on imported posts. vii) Send DMs – you can communicate with your followers directly and keep them informed automatically through this feature. i) Like, Share and Comment Update – FollowingLike helps you like, share, or comment on search and imported updates. ii) Like, Share and Comment Posts – The tool also helps you like, share, or comment on search and imported posts. iii) Follow People – The feature allows you to auto follow users discussing a certain topic or those who have followed you. iv) Search Update – The bot automatically searches for updates based on keywords used by other modules and the keywords you use as well. v) Search People – The bot automatically searches for people you want to follow based on keywords use by other modules and the keywords you used as well. vi) Search Posts – The bot automatically searches for people you want to follow based on keywords use by other modules and the keywords you used as well. In general, there’s much more FollowingLike can do for you and you can find it here. FollowingLike’s price is quite reasonable and affordable. However, unlike most bots, you only pay a one-off fee and this is a good thing for you because you will not need to pay monthly. At $51 you can have a 1-account version. For a number of accounts, you will need to have $73 to get it. Socia10x is a social media bot that works for almost all social media networks. Your Instagram, Twitter, YouTube, and Facebook daily experience is safe with this automation tool. With Social10x you can gain followers, likes, views, comments and even more. You can now buy Instagram likes, comments, and followers thanks to Social10x for Instagram. For as low as $6 you can get up to 500 followers delivered in 2 days. For $9 you can get 1000 followers and at $19 you will get 2500 followers. If you need 5000 followers in just but 1-2 days, you will need to pay $29. Aside from followers, you can also buy likes and comments. The packages are outlined below. For 100 Instagram automatic likes, you will have to pay $14. For 250 likes you will need $23 dollars, for 500 likes you will need $34 dollars and lastly for 1000 likes, you will need $59 dollars. Once you pay the package you are interested in, you will earn the respective likes on your every new upload. For comments, you can earn 10 comments if you pay $31, 15 comments for $41, 20 comments for $49 and 25 comments for $59 all delivered in a span of 48 hours. You can buy Twitter followers and Twitter likes/retweets thanks to Social10x. To earn 500 followers you will need $6. You can also pay $9 to earn 1000 followers. If you want 2500 followers you will need to pay $19 and the last package offered by Social10x is gain 5000 followers if you pay $29. For retweets, you will need $7 to get 100 retweets, $12 to earn 300 retweets, $19 for 500 retweets and $29 for 1000 retweets. All these are delivered in just a span of 48 hours. For YouTube views, you can earn up to 2000 views for $17. You can also decide to subscribe to another offer of 5,000 views for $37. Social10x also offers 10,000 YouTube views for $64 and lastly 25,000 views for $64. For YouTube subscribers, you can earn up to 100 subscribers for $29, 300 subscribers for $49, 500 subscribers for $97 and 1000 subscribers for $149. All these packages are delivered in 48 hours once you pay. Social10x for Facebook can help you buy Facebook Followers and Page Likes. To earn 500 followers you will need $9, 1000 followers for $29, 3,000 followers for $69 and 5,000 followers for $99. Somiibo is one of the popular bots used in almost all social media platforms. Somiibo is a free auto follower, reposter, liker and player for social media. The social media bot is one of the easiest to use. Once you install it, you are going to fully automate your social media activities and take advantage of how this simple bot will change your social media life. A premium Somiibo will get you free likes and followers on Facebook, Twitter, Instagram, AddMeFast, SoundCloud, YouLikeHits among many more. In fact, this bot has a unique marketing approach working on the principle of reciprocal relationships. This means it widely interacts with other social media users encouraging them to not only follow you but also like your content. Therefore, whether you are a photographer, an entrepreneur, a marketer, or even a musician, Somiibo has got your back because it is clean and professional with a decent design and highly compatible with most devices( Mac and PC). MonsterSocial is a social media automation bot for your Twitter, Facebook, Instagram, Pinterest, and Tumblr. Having been created back in 2013, the tool boasts of over 3K satisfied customers. Few of the users who have monster social have had a good word about it. For the general social media activity – The bot can let you follow and unfollow accounts. The accounts or profiles can be found through hashtags and in your following and followers list as well. You can import all accounts from text files and then do a thorough checking if they are functioning properly. The bot also helps you choose respective proxy for every account. Sometimes, the bots assign the proxies randomly. Accounts which have no proxies set always use the default setting proxy. With this bot, you can multi-thread on social media platforms. With multiple proxies, you can run multiple social media networks, on multiple profiles on multiple features. Monster Social can asp create a whitelist of certain profiles. By that, they exclude some of the strange profiles from friend request suggestion, event joining features and page likes. For Twitter – You are able to like, comment, share or retweet a certain tweet with all your accounts. For Instagram – This bot allows you to comment on a post with all your accounts. Every social media package from Facebook, Instagram, Twitter, Tumblr to Pinterest will cost you $39.99 for 3 months. But you can get an all in 1 package at $99.99 for 3 months. You can see the prices here. FollowLiker is a powerful super flexible and reliable multipurpose tool that automates most of your social media tasks. FollowLiker has the ability to grow all your social media accounts. From Twitter, Pinterest, Tumblr to Instagram. i) Follow Users – The tool lets you follow users automatically based on keywords and hashtags. ii) Unfollow users – The tool lets you follow users automatically when you are not interested in them or when they do not follow back. iii) Like and Unlike posts – FollowLiker lets you like and unlike post on almost all social media platforms named above. iv) Comment on Posts – The tool comments automatically on posts made by users on Twitter, Pinterest, and Instagram. v) User search – On all the platforms that software supports, you can now automatically search for users based on keywords and choose the action you do when you find them, including following them. vi) Post search – On all the platforms that software supports, you can now automatically search for posts based on keywords and choose the action you do when you find them, including sharing them. Send DMs – You can directly and automatically send private messages automatically using this too on all the platforms named for this tool. Specific bots and automation tools have been created to function on different social media channels with the aim to automate most tasks on the given channels. We will take a look below and give examples of top bots and automation tools in each category. Instagram has grown so fast. Being one of the most popular channels, there is a lot of action that goes on on the platform every time. As a marketer or user, you have to be present most of the time to go head to head with your competitors. Putting in mind that most people do not have a lot of time these days, Instagram bots and social media tools have been created to automate and make Instagram activities easier . We have named general bots which also work on and for Instagram above. 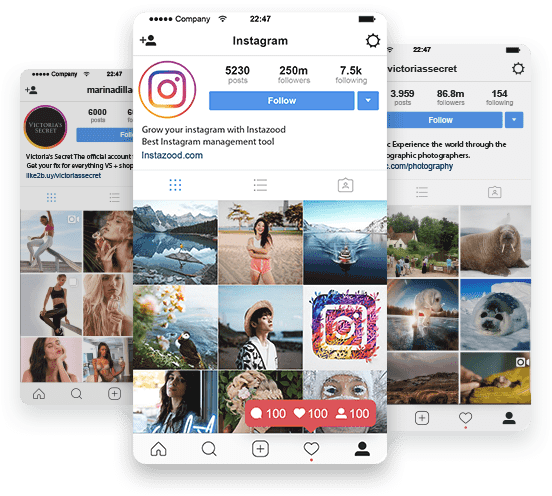 However, on the following list provided below, we have outlined the best Instagram bots and social media tools that work merely on Instagram. The bots have made Instagram a better place and the ‘Instagramming’ experience turns out to be thrilling, to say the least. Instazood is an Instagram bot with automatically follow, unfollow, comment, post in an instant and can DM other Instagram accounts as well. Instazood has been an outstanding bot. The Instazood service is quite genuine and once you jump on its bandwagon, you will get real followers who are interested in your feed. i) Full control – The bot provides you with full control in terms of customization options and filters that help you get more followers, comments, and likes for your Instagram. ii) Security – Instazood has been designed with a special kind of security system that automatically reduces the speed of the bot. The security setting ensures that your Instazood activities do not go beyond the Instagram limits. iii) Mobile friendly – The bot functions seamlessly on all mobile phone devices and this means you can access, monitor and manage the automated activities from anywhere whenever you want to. vi) No Downloads – At the time of downloading and acquiring the app, you will not be prompted with other side downloads. vii) Powerful Dashboard – Instazood has quite a not only amazing but a powerful dashboard. The dashboard is so sleek that managing your Instagram activities and accounts will be a task you will like doing every time. viii) Time-Saving – This bot has been designed to save most of your time. You only need a few minutes in your day. That means if you are a busy person, Instazood got your back. Your Instagram engagement is safe with this bot. Point to Note: You can as well buy real Instagram followers through this bot. If you are looking for an automation tool that can organically grow your Instagram, then Social Steeze should be at your service. At least every Instagram user usually fancies growing their accounts and the concept of growing Instagram accounts isn’t anything new up to this point. 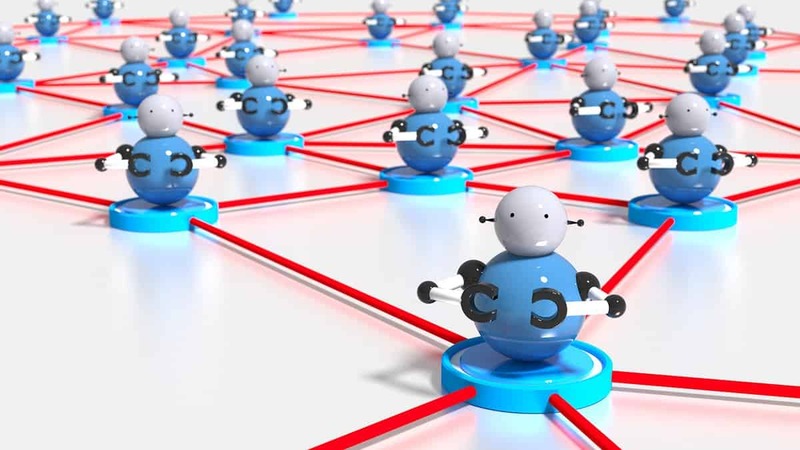 There has been a rise of so many automation tools and bots on the market all over the internet that promise account growth but most of them are surrounded by safety and risk issues. At Social Steeze however, you are assured of organic growth through established expertise for your brand account on Instagram. Therefore, if you are looking for a service that is ideal for your account growth without having to buy specific leads then get Social Steeze. Effortless – This bot is characterized by amazing dashboards which require no extra efforts at all. All you need is fill a form, and you will receive a call from Social Steeze expert. Choice of Target – With Social Steeze you can choose the kind of followers you will need for your growth. Whether you want followers from specific geolocation. For instance a certain city, province, state, town or country. Also for the growth of your Instagram account, Risesocial is quite an amazing and powerful automation tool that will get you active and genuine followers. Sometimes, growing an Instagram following can be exhausting and tough. However, with this bot, you will get followers based on the niche you want. For instance, perhaps you want followers from a certain country, Risesocial will provide just that. Risesocial is quite efficient and fast at what it does that all the activities will be done on your behalf as you get busy with normal daily activities. i) Ease of Use – You will need no downloads with this automation service. Once you jump on its bandwagon, you will be surprised by how much your Instagram will grow. ii) Guaranteed Growth of your Account -With this automated service, you will get real and active followers who are actually interested in what you do. iii) Affordable – The service is quite affordable and it’s one the cheapest Instagram automation service you can ask for. iv) Powerful Service – Risesocial provides you with quite a powerful service, leaving your account so famous over the platform. You will only need to sit back and relax and watch your account grow so fast. Likesocial is an amazing Instagram tool that gets you likes on every new post. This delivers enough organic engagement on your post. Aside from that, Likesocial gets you more followers. Likesocial is popular for building a real presence without it looking like a spam activity. What you only need to do is get the tool, and at your desired speed, Instagram Likes will be delivered to your latest upload. Select the number of automated likes you want to get in your new upload. With your Instagram username, buy the service. This also works for Instagram views and followers. All you need to do is to select the number of views and followers for your video and Instagram account respectively and leave the rest to Likesocial. Follow Adder is one of the topmost rated bots. Actually, it is one for most business Instagram users or marketers who need a program that can manage, customize and set up easily. Aside from that, this tool is multifunctional. i) Scheduling – The bot is capable of scheduling your posts and publish them later at a preferable time from your computer. Additionally, it can publish all the posts immediately. iii) Engagement – Within the bots dashboard, you are able to engage with your audience and ultimately grow your account. The bot creates search streams that find specific keywords, hashtags and users which in turn gives you an opportunity to engage with the right audience as well. Planning is one of the most important strategies in marketing. The same applies to special social media marketing channels and especially Instagram. PlanMyPost bot will help you plan your Instagram quite well that you will do your normal daily activities without having to worry about leaving Instagram out. With this bot, you will get in-depth analytics and easily schedule our post in one go. The advanced analytics helps you measure the uploads and this future-proofs the perfect content for your followers. Aside from all that, through good planning, you will get your Instagram to grow and have more users. The bot has a number of versions; from Demo to Professional which are paid for differently. You can check on the plan my post price tags here and purchase as you may require. From statistics, Twitter bots have actually made social media or internet generally quite a better place. In fact, the bots account for a close to 15% of the total Twitter users. In other words, they have changed and are still revolutionizing the politics of Twitter and they are the preferred tools to use. The twitter bots have been an outlet for automation, creativity, self care and even reflection. That means you can rely on them and let them fill your twitter feed with all but good vibes. 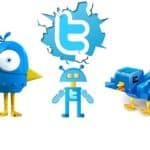 Having named FollowingLike and Jarvee on the general social media bots and automation softwares/tools, we will narrow down to bots that are specifically designed for Twitter. 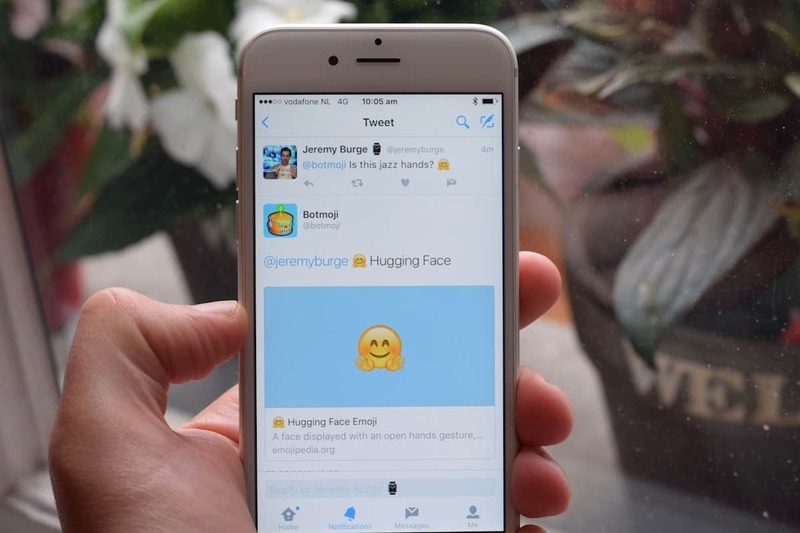 Botmoji is an Emojipedia Twitter bot that helps Twitter users to master the art of using emojis. What you need to do is tweet at @botmoji and boom the bot tells you what it is. Followr is a secure Twitter Extension bot for Chrome that lets you get more followers quite quickly. Though still new on the market, the chrome extension is free and easy to install. For the short time ever since its creation, the bo extension has received quite some good praise from the users who have already put it in practice. Powerpack is new on the market, but the bot has already shown that is it already quite amazing. The bot helps you launch campaigns and also build your Twitter especially if you are a brand. It is a creative powerhouse that gets most of your social media marketing activity a success. Tired of tweeting Twitter messages? Then it is time to add something more to your tweets. Slashgif is an amazing bot that allows you to search for animated gif for your tweets and thus adding more fun to them in the long run. The bot is easy, simple and quite fun to use. Nectar Ninja is quite an amazing Twitter bot. You can use it to send notifications via Twitter from your website. Nectar Ninja is actually free. It may not be so popular but your website activities, as well as tweeting activities, are simplified with this bot. Robolike is a special bot that lets you increase your organic followers on Twitter. 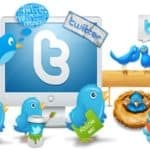 The multi-functional software will take good care of your Twitter activity as you get busy with your normal daily life. The full package of this bot goes for $7 but there is a free trial version of the bot. Olivia Taters is a name of a lady but it’s actually a bot and not a Twitter user. But for a fact, she usually sounds more real than most girls the account emulates. The bot was created accidentally by Rob Dubbin, who at the time was trying to experiment with an actual teenager’s. Olivia Taters bot has the ability to reply to users who follow her with profound tweets than most human can. The most amusing moment was when Olivia was busy tweeting with another bot and the customer care service account of Bank of America chimed in. You have probably heard of Netflix and the Netflix bot on Twitter provides just that. With this bot, you are able to stream steady videos provided on the Netflix TV in the US. The Dear Assistant bot is an amazing bot created by Amit Agarwal. The bot has answers to a variety of questions. Aided by the intelligent Wolfram Alpha search engine, you will be provided by answers from general questions you ask. 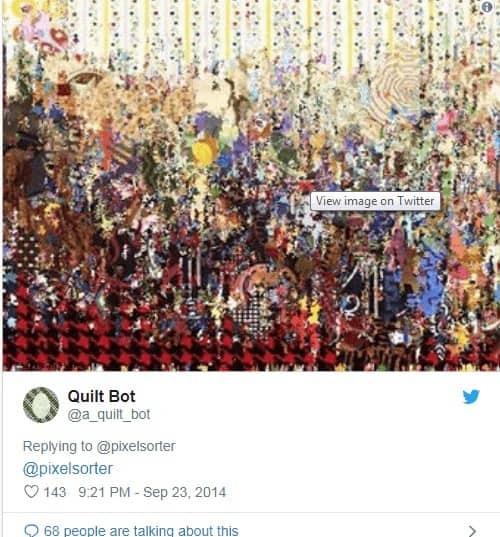 Quilt bot came to limelight when Pixel Sorter began flirting with it. Created by Bob Poekert, the app is capable of applying quilt fabric patterns to any images on Twitter. Actually, the team of two(Quilt and Pixel sorter) can work together to produce magic on the images on Twitter. 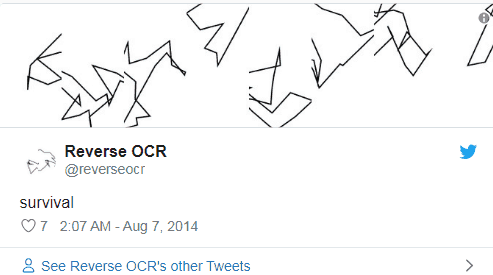 Reverse OCR is a beautiful algo-art bot created by Kazemi Darius. The bot has the ability to draw random lines to a point that the OCR(Optical Character Recognition) software executes it as a certain word. The Museum bot was created by humans and not algorithms but it is an amazing art bot. It features what we would call random images from the free online archive called Metropolitan Museum of arts. Created by Cameron Spencer, the Accidental Haiku bot enables you to look for tweets that are unwittingly composed in the Haiku structure. If you like this bot, then you are more likely to like Jacob Harris’s Tumblr that finds the Haiku written in the New York Times. Portmanteau may not be so popular but it is an amazing bot. The bot is capable of inventing just a different language altogether just like the famous thrice-dotted bot that creates new words bt mashing up together some real English words. Created by David Yanofsky, the Fake Bloomberg News bot takes few actual headlines and, in turn, forms a new one that makes sense just like the original. That explain why some people come across poetry in weird of places, for instance, inscrutable headlines that are obtained from Bloomberg news. There a comes a time when you just want to draw attention and that is what exactly Awl Tags does ever since its creation. The bot turns the “caps on” and tweets the tags, sometimes evocative usually applied to each new story on the Awl. it turns out that these tags become more enticing than the normal headlines. Also created by Darius Kazemi, the creator of Reverse OCR, the Autochart bot is able to generate nonsensical flowcharts and Venn diagrams. The charts are actually good but if you think otherwise, then you can opt to use the recommended charts made by humans here. @jonnysun, a Twitter citizen created TinyCarebot, an actionable self-care reminder bot that gets your tweeting job done on twitter, for users who are obsessively on Twitter. The bot works by posting a gentle note that tells you to do something every hour. As we talk, Tinycarebot has 137K plus followers, and that says how much the Twitterverse has embraced the use of the reminder bot. 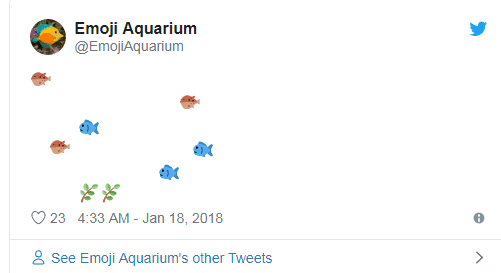 Created by Joe Sondow, @EmojiAquarium gives you an option for animated therapy when the actual use of animals on twitter is not in use. Every few hours the aquarium displays a tiny aquarium full of interesting fishes. Joe designed the bot to provide an underwater option in direct response to Twitter rants that were all-caps. @Katie Rose Pipkin created the @Tiny_Star_Field twitter bot. This bot is for you if you just need some little space. Using standard Unicodes, the bot transforms tweets into celestial windows and creates a beautiful portal of stars on your screen. Created by Charles Burquit, @I_Find_Planets bot sets out to find new planets and send back signs of life. For example, when you meet news like the one below, you might end up thinking the earth needs a backup plan. The ThinkPiece bot has done quite well. Developed by Nora Reed, the bot takes the Clickbaiting, formulaic of internet headlines and fills the gaps with the buzzwords. Therefore, anytime you want to tweet and or read other hot takes about millenials, you will read this instead. Maybe you are not satisfied with mere facts, DeepQuestionBot asks deep, difficult and at times trivial questions. Therefore, when you have a sort of a question that you would fear asking, this bot can help you too. Created by Allison Parrish the bot transforms facts into common sense question that makes sense and easy tweet. Created by George Buckenham, the bot creates moving landscapes, sparsely spaced and you might get lost in in your daily twitter activities. How beautiful can algorithms be? Softlandscapes have become so popular lately having more than 19K followers. Created by Way Spurr Chen, Pixelsorter is an amazing bot that you will need for your inspiration. If you tweet any image at Way Spurr Chen, it will shift and re-sort the rows of the pixel and ultimately create entirely something new. At exactly 10.17a.m every morning, Grow_Slow bot takes a pic of a fiddle-leaf fig plant. The whole idea created by Nicole He and over time, you can view the plant change and grow. The whole idea is amazing, and it is the best of Twitter you can think of. Created by Filip Hracek’s, the Year Progress is a bot that is a helpful reminder and will always tell you that you have time on your side. The bot generates a progress bar for you for the current year ahead. Well, we named some of the bots under the general social media bots and automation tools, which were mainly for the normal daily ‘facebooking’ activities like; follow, like, comment, and send friend requests, among others. Now it will sound sensible if we mention some of the Facebook bots only designed for Facebook on Facebook to automate the marketing experience and eventually make it easy. We will name some of the bots that have done pretty well on Facebook already. Fynd’s Fify is an intelligent transaction and fashion discovery bot. Fify will remember people’s tastes and preferences in terms of fashion. The bot alerts you with the new arrival and at the same time gossip about the latest fad of a celebrity. Fify tends to behave like a human, and changes behavior for different people. Fify will first talk about the Fynd Fashion and as you keep interacting with it you will find there is more about in terms of fashion. Fynd Fify has been voted as one of the best eCommerce bots that has been created for Facebook so far and marketers can look up to it. Twyla Facebook is messenger bot made with artificial intelligence and it puts a smart chatbot in your live chat channels. The bot answers questions on your behalf, frees up your agents, and selects tickets for you as well. To Facebook marketer’s this is an opportunity to automate some of the activities especially when you are busy and not online. Aside from that, you can do up-selling and cross-selling through this bot regardless of it being a kind of plug and play kind of bot. The Burger King bot just made fast food get faster. With this bot, you can easily make an order and pick it up on your demand. You only need to select items from the menu and choose the closest of the restaurants for delivery. What makes this bot more interesting is that it provides you with an estimated price and time for your orders. For marketers, this bot is a blessing in disguise. The bot’s intelligence works pretty well and you will not need a mobile app to do fast food services. Marketers can easily buy this idea. 1-800-Flowers is a messenger chatbot and it is one of the best eCommerce bots on Facebook. If you are looking order flowers then you would rather go through this bot other than websites. With this bot, you will not need to go through a lot of steps to make a purchase. The messenger bot pings clients on various occasions and sends them Facebook messages to remind them about the need of having to buy flowers. Aside from that, the bot notifies that flowers have been delivered. The combined physical and digital experience done by this bot has upped the flower delivery business game. Spring is another eCommerce bot that helps users in a series of questions – fashion related to helping them as they make purchases. The bot will then direct you to their website once the users make their choices. For marketers, this bot can be used for upselling and cross-selling your products. It was made with quite an intelligence and it is easy to use. Wall Street Journal is a bot that provides users with market data, stock charts, and latest breaking news. Once updated with any kind of news, the bot will ping its users. Just like Wall Street Journal, publishers and marketers can get you the subscribers and eventually drive them into the Facebook DM. HealthTap is a bot that aims at providing users with a fast connection to doctors through their network of over 1k doctors. If you think of this kind of perspective in terms of 24/7 bot then you will realize how it has a huge impact. BeSure Messenger helps you find all types of imaginable restaurants based on location. However, the bot serves San Francisco, Copenhagen, and just a few more cities. An expansion is on its way though. Marketers can always look up to this kind of bot and understand the algorithm it uses to find recommendations and locations that quickly. KLM Airlines is a Facebook bot that offers an easy, painless and quick way to travel by flight. You will find ticket information, flight information, and up-to-date flight information through this bot. Marketers have found this bot quite useful especially if they offer services that prompt you to book. Just imagine being able to book a flight through messenger. Good and quite interesting right? Definitely yes because it even takes a shorter time compared to having to book on the main flight website. Even more, notifications come through your Facebook messenger and not email. Zork bot works just like the old Dos Adventure game that we used to play back in the time on a black and green screen except that this works on Facebook Messenger. Marketers have found this kind of bot so helpful. The bot demonstrates how well you can add gaming dimensions to your bots. That also means that if you are a marketer who likes telling stories, then you can choose and design your own adventure bot that not only educates but sells potential clients that follow you all along. Marketers can, in fact, take advantage of this kind of bot by creating twists and turns in their marketing activities that go in this direction. Just like all other social media networks, linked has grown big time and boasts of over 450m users currently on the platform. 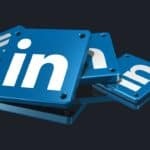 As the platform keeps growing, it also means that the overall activities in terms of LinkedIn marketing are also growing. 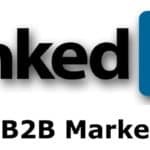 That in turn, means that you are going to up your LinkedIn game to get the most of the prospects, otherwise your marketing experience will not turn out t be as successful as you ever dream of before. For that reason, LinkedIn bots have been created to help you automate your LinkedIn activities. These bots have indeed had a huge impact as they let you concentrate on the critical part of your business as they automate most of your other general daily LinkedIn activities. We, therefore, take a look at the most helpful LinkedIn bots below. If you are a serious LinkedIn marketer then LinkedInHelper is an amazing bot that you do not want to miss. The automation tool works magic in automating your LinkedIn work. Below is a list activities Linkedinhelper can do for you. ii) LinkedInhelper also automates the mail and the responder system as well as sequential messaging to LinkedIn Group Members or first connections. x) Linkedin helper is quite a powerful list manager and it lets you build a lead generation and at the same time avoiding interruptions in between campaigns. There is more to LinkedinHelper than discussed above. If you want to know more about it you can read it on their main webpage. They have discussed every detail you can ever want to know about the bot before you finally jump onto the bandwagon. Nevertheless, we can talk a little about pricing here. It costs you very little to buy a full package of one full browser installation. The package is split into 4 categories. For the 1st category, you only have to pay $15 for a monthly purchase. The price per month reduces as the duration of the package you want to plan to increases. For example, in the 2nd category, if you choose a 3-month package, you will have to pay a total of 40$ which means you will pay $13 .33 per month. For the 3rd category, if you choose the 6-month package, you will have to pay a total of $60 which means you will be required to pay $10 per month. Last but not least, the 4th category which is a 12-month package, will need you to pay a total of $99 which means you will pay $8.25 per month. Below is a video of how LinkedInhelper works. Dux-Soup is an amazing LinkedIn bot that has been regarded as the smartest lead generator on the network. Once you get this bot, it will be easy to find, draw attention and most importantly engage with your potential customers on LinkedIn. That means you are going to save your time and focus on the important sectors of your business because Dux-soup makes the prospect join on your behalf. Dux-Soup now has 40,000 plus users who are now enjoying the ability of the amazing job the bot does. Dux-Soup builds relationships between you and your prospects instead of having to chase them. This, is in fact, the primary aim of this bot. Aside from building relationships, the bot automates most of your LinkedIn activities such activities include; automatically viewing your potential customers’ profiles, endorsing their skills, following their LinkedIn activities and sending personalized messages on your behalf as well. Dux-Soup is indeed a special tool, it manages your prospects, download profile details which you can use to improve on strategies to get more leads. One of the main benefits of this tool is that it is safe to use and you can use it as a team or an individual. Aside from that, it is available in a number of languages(9) including (English, French, Dutch, Italian, Russian, Spanish, German, Portuguese, and Polish). However, with all said above, it is good to note that this bot is quite affordable and the pricing solely depends on what you want to achieve for your LinkedIn account. In fact, you can use the app for free on some of the general LinkedIn accounts. You are only required to pay around $11 to get a professional Dux-Soup version that fits your lead generation process. You can find more about pricing here. Pinterest has grown ever since it was launched. It is among the marketing platforms that you can bank on to get leads as a marketer. Just like other social media marketing platforms, bots have been created to automate Pinterest activities; from finding followers who are likely to follow your account, to scheduling your pins to post on your account and finally sending invites to prospects to encourage them to check your boards. Let’s quickly dive into the bots that can take your Pinterest experience to a completely new level. 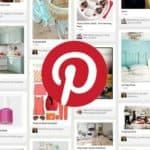 Having named Jarvee and FollowingLike which are general social media bots above, we, therefore, take a look at Pinterest bots designed to make Pinterest and only Pinterest a better platform. 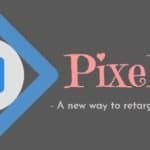 Pinpioneer is the on of the best Pinterest automation tool you will ever find. This tool helps you build your Pinterest presence, boost your traffic and increase links in just a span of 12 hours. With PinPioneer you will get unlimited content for any niche. The tool then makes sure it’s properly SEO’d, Linked and thereafter uploaded to your Pinterest account automatically. Here are the features that come with Pinpioneer that helps you make a difference in just but 12 hours. i) Pinponner features a Socket based system that provides you with the fastest pinning system on Pinterest in the world with around 1K pins in just an hour. iii) With Pinpioneer every action on Pinterest is automated. You can schedule comments, follows, comments, repins and likes. All you need is to set it up and let it do the magic. iv) You can easily link Pinterest to other social media networks, including Twitter Facebook and Instagram automatically. v) Pinpioneer lets you manage a number of accounts that is in case you have multiple Pinterest accounts. vi) Your images will be uploaded with an Automatic bulk watermark giving them a sense of authenticity and originality. vii) The tool also has a Spintax feature that helps you to avoid posting the same message. It does this automatically, a process we would call message spinning. viii) PinPioneer also automatically replaces the Pinterest’s source URL with your own. ix) With this tool, you can also follow/unfollow accounts based on boards/people/keywords among other criteria. x) You will get mass liking support once you jump onto the Pinpioneer bandwagon. xi) Pinpioneer also gives you Pinterest account rotation support that lets you change from one account to another as many times as you would like. You will be able to purchase PinPioneer with just $79.95. You only buy it one time and get all the features named above. There are no monthly fees and you will get free tool updates every time they are released. This is quite a reasonable offer putting in mind that it is just a one time offer. NinjaPinner is a special Pinterest automation tool that automates most of your Pinterest activities. The tool is quite easy to use and also works on both Instagram and Tumblr. i) Auto-follow – The tool does an automatic mass follow on Pinterest users based og categories, board followers, and search results. ii) Auto-unfollow – The tool does an automatic mass unfollow on Pinterest users who did not follow you back. iii) Auto-repin – The tool does an automatic repins on Pinterest users based og categories, board followers, and search results. iv) Auto-upload – The tool does an automatic mass upload of your images or CSV files to your Pinterest board with your customized source URLs and descriptions. v) Auto comment – The tool does an automatic mass comments on Pinterest users’ pins based og categories, board followers, and search results. vi) Auto – download – The tool does an automatic mass download of images to your computer. vii) Multiple Accounts – With NinjaPinner you can have a number of Pinterest accounts that can still be handled quite smoothly. viii) Amazing customer support – Suppose you have any questions and need any clarifications, the Ninja Pinner customer support team is just an email away. You will always get a response within 24 hours. 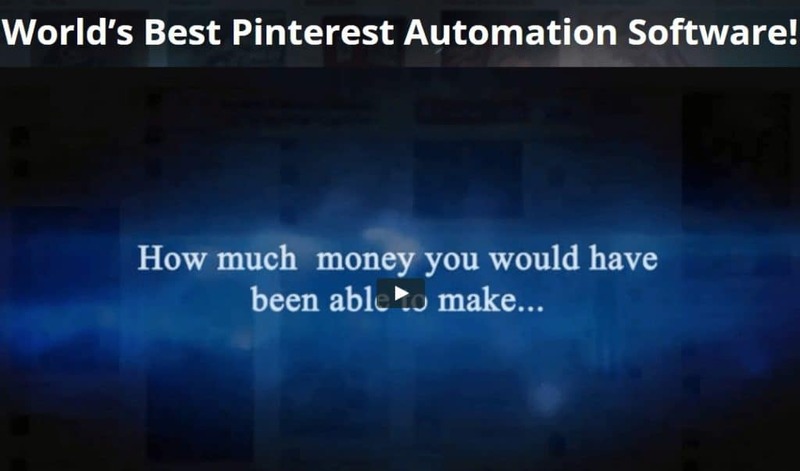 Pin Blaster is one of the world’s best Pinterest automation software.The tool is quite powerful and automates most of your Pinterest daily activities. The pin will save most of your time and can do the following for you on Pinterest. ii) Pin/Repin/Like – The tool helps you to pin, comment, repin, and like your users content. Pin Blaster does all that for you once you set it up. iv) Multiple Accounts – Pin Blaster handles a number of Pinterest accounts at the same time. Boost your Pinterest marketing by having a number of accounts which can be supported by Pin Blast, a tool that automates and makes you work most easy. v) WordPress Content imports – With this tool, you will be able to download images and upload them on your WordPress automatically. v) Comment Pins – Commenting on users posts helps you engage with them and Pin Blaters automates commenting on people’s pins. With a single click, you can mass comment on multiple pins on different accounts using the multiple thread feature. A number of YouTube bots have been created to help YouTube users and marketers to boost their channels by getting more subscribers and viewers. We have named the best two we think will be good for you as a marketer or for anyone who has a YouTube channel to grow. Subpals is one of the best YouTube bots that has been designed. With this tool, you can grow your YouTube channel faster than you can ever imagine. Subpals has a number of features that makes it stand out. The main good thing with this bot is that it is free to use. You get it absolutely free for the basic and starter package. i) Free to use – This bot offers such an innovative network and helps you get 10 10 new YouTube subscribers for every 12 hours for free. If you are looking forward to getting earn more subscribers, you might want to choose the other paid package options. ii) Easy to use – Subpal was created to be quite easy to use and as humanely as possible. Subpal designers understood that your time is so important that they went on and developed a tool that gives you 10+ free subscribers for your channel for only some little of your time. iii) Real Users – Subpals aims at increasing your subscribers by linking you to other YouTubers. That means you will get real account subscriptions which makes it the most affordable and effective way to grow your channel. You will feel the confidence once you start interacting with the bot at any time. iv) Results You Can See – You will be able to see the growth of your channel once you are in and running. Your subscribers’ count will rise just on the same day you will sign up and sign in. 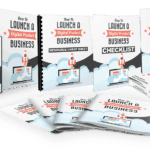 Every plan is designed to start working quickly towards the growth of your channel’s exposure and credibility. v) Friendly support – The Subpal team is friendly and always available to help. Expect a timely response anytime you pop in with a question or need help. The Subpal team support is just an email away. Even when the starter and the basic version are free, there are other Subpal package options that are paid. You can get the Enterprise package that goes for $20 per month and you will earn 15 real subscribers every day. You can as well choose the celebrity package which with $80 per month will earn you 60 real subscribers every day. Aside from the subscriptions, Subpal offers other YouTube Marketing Services too and you can find more about that here. View2be is a YouTube tool that automatically gets you free YouTube views. The bot boasts of thousands of users already who are already getting the likes views from other YouTubers to boost their channels. Once you get the most of the views and Likes, you will be able to propel your YouTube rankings and hang among the best YouTube channels. You will notice that in Google’s search results as well. The concept involved in this bot is quite interesting. You do not need to buy it. You only get it for free when you sign up. However, you earn View2be coins when you watch, like and comment on videos. You will then be required to complete offers and then you will use the same coins on videos on your channel to start getting free likes and views on your channel. 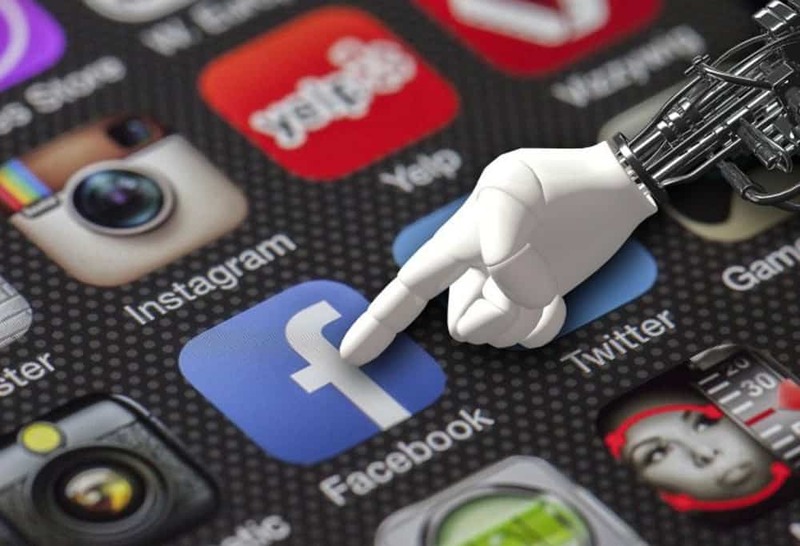 There goes a complete list of top social media bots if you pick the right choices for your social media, then you are on your way to having fun on social media regardless of your favorite platform. Choose your suitable bots and automation tools and take your social media by storm. James is a Social Media Marketing Expert who has helped over 60 companies increase their profits using Social Media channels. His expertise covers creating viral campaigns for brands, social branding and increasing following and engagement, as well as generating sales from various social channels. This copyrighted material may not be republished without express permission. The information presented here is for entertainment purposes only. DISCLOSURE: You should assume that this website may have an affiliate relationship with the persons or businesses mentioned in or linked to this page and may receive commissions from purchases you make on subsequent web sites. You should not rely solely on information contained in this website to evaluate the product or service being endorsed. Always exercise due diligence before purchasing any product or service.